One of Greece's largest banks wants to estimate the danger of panicked withdrawals from the bank's ATMs due to the financial crisis. Panic can have a great influence on any decision process. It plays an important role in stock market crashes and bank runs. On-line rumors are perfectly built to infect the public. 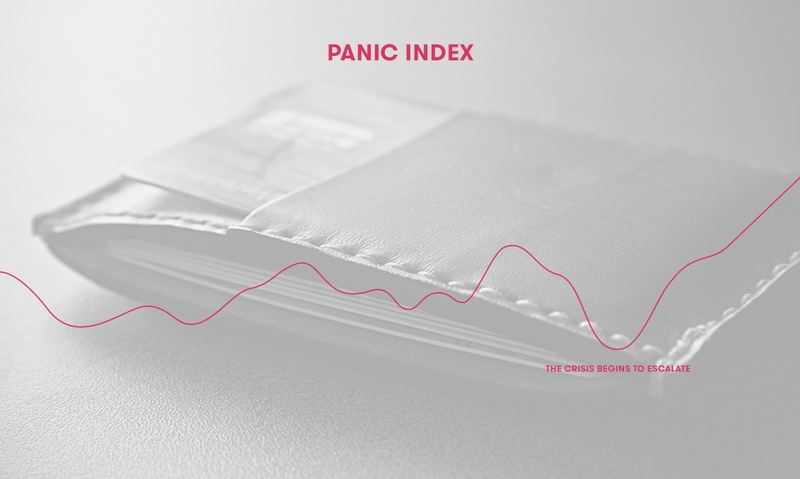 In times of extreme psychological pressure, such as in the current financial crisis in Greece, a panic index can explain the herding behavior of the people. We created a dictionary containing words, phrases and expressions that are emotionally associated with panic. We also detected negative words and applied a model to understand the scope of the negation because it completely reverses the meaning of a panic expression. Next, we searched for expressions on Facebook, Twitter and fora that might show any spontaneous coordination of people to run to the cash machines or to the bank in order to withdraw their deposits. The rise of the panic index nicely correlates with the escalation of the crisis. On the other hand no coordinated action has been detected, only sporadic posts that show panic and willingness to withdraw money from the ATMs. The bank has also compared the outcome of our analysis to their internal data about the withdrawal rates and the bank's liquidity levels at any time.